The Reno, NV-based Debtor lists approximately $8.7 million in liabilities. Debtor Name: American West Development, Inc. The Debtor is represented by Fox Rothschild LLP as counsel and Province Advisors LLC as financial advisor. Among others, top unsecured creditors include JPMorgan Chase Bank, N.A; California Bank & Trust; Bank of America, N.A and Wells Fargo National Association. Debtor Name: Castle Home Builders, Inc. The petition lists Ameris Bank as a creditor with an approximate $4.13 million aggregate secured claim. Tags: Castle Home Builders, Inc. 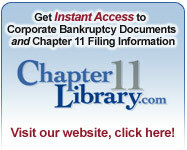 Debtor Name: Maronda Homes, Inc.
Sign up for our Chapter 11 Notification service now! Contact Ken at ktroubh@nationwideresearch.com for details.